Guest Bio: James Hubbard, MD, MPH, is one of the nation’s top survival-medicine experts.At his popular website, TheSurvivalDoctor.com, he writes about how to deal with medical problems in a disaster or whenever expert help is impossible to get. Dr. Hubbard is often featured in the media for his expertise and is the author of three books, including his latest, Living Ready Pocket Manual: First Aid, a Nielsen bestseller. He’s been a family doctor for over 30 years. A graduate of the University of Mississippi School of Medicine, Dr. Hubbard trained at the acclaimed Parkland Memorial Hospital in Dallas. He has a master’s in public health and is a member of the American Academy of Family Physicians, American College of Occupational and Environmental Medicine, American Medical Association, and Wilderness Medical Society. 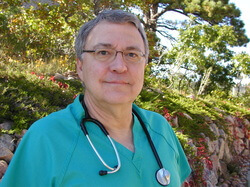 Dr. James Hubbard talks about the Middle Eastern Respiratory Syndrome or M.E.R.S. virus. Neal Howard: Hello you’re listening to Health Professional Radio. I’m your host Neal Howard. Thank you so much for joining us today. A patient was identified in the State of Indiana in the United States with the new type of virus. Not necessarily new, as in having just been discovered but new as far as the spreading from human to human was concerned. Our guest in studio today is Dr. James Hubbard, one of the Nation’s top survival medicine experts. And he has a popular website, thesurvivaldoctor.com where he writes about how to deal with medical problems in a disaster – on hikes when you’re out camping or whatever expert help isn’t available or maybe impossible to get to in a timely fashion. His latest book is “Duct Tape 911: The Many Amazing Medical Things You Can Do to Tape Yourself Together.” He’s also written “Living Ready Pocket Manual: First Aid The Survival Doctor’s Guide to Burns,” and “The Survival Doctor’s Guide to Wounds.” He’s been a family doctor for over 30 years. How are you doing today Dr. Hubbard? Dr. James Hubbard: I’m doing great. How are you? N: Great, great. Thank you so much for joining us today. The new virus that was identified in the United States – the first case in the United States in Indiana late last month, I think around 23rd or 24th of April – a Middle Eastern Virus. Could you talk a little bit about of that virus and let us know why it’s so important that we learn about it? H: Well you’re right, it is a fairly new virus. I don’t think people really knew it at least until about a couple of years ago. It’s coming from the Middle East that’s why it’s called Middle Eastern Respiratory Syndrome. So the problem is that it is a virus so obviously there’s not much you can do about it and about 30% of the people who get it die because usually because of pulmonary problems – pneumonia, respiratory failure, that sort of thing. Now they’re still studying it so and not sure exactly where it started. They think maybe it’s a Coronavirus and same as the SARS virus back about 10 years ago which I think started it in Asia. Same type of virus but not exactly the same. This is one of the, they think started in bats, bats gave it to camels and they think camels have somehow given it to people and then there has been some person to person transmission. So far, it’s now what you recall really highly contagious like the Flu or something like that but somebody who’s been in contact, who is in quarter’s quarter with someone else can get it. It’s been localized to the Middle Eastern Countries and it seems to be growing quite a bit there. I don’t know, I think there’s about 800 documented cases now or maybe more. H: 800, yeah. And at last I saw on the internet, and so there’s obviously more than that because also there’s the undocumented cases. And then some people get it and just have very, very mild symptoms or no symptoms. They’ve had the blood test with antibody showing that that happens, so they may be contagious too, although they don’t have symptoms. But so far, it’s been in the Middle East or the person like you said came from the Middle East and that’s into the United States and that have come to other Countries to. So the main thing is the one in the Middle East of course the CDC they make sure that no everyone on the plane, I think in that in bus too, everyone will be asking and see if anyone, again had the MERS type virus. But right now, the main worry in the United States would be the healthcare workers and be very aware of somebody who’s traveled to Middle East within the last 14 days and has fever and cough or pneumonia. N: The symptoms found like flu symptoms. N: Is this a new virulent form of flu or is it something far removed from the flu? You talked about bats to camels, I’m assuming through the bats biting camels. But from camel to human, is that’s not a far stretch from animal to human in this new type of flu? H: No. You know flu a lot of times comes from some animas and comes in contact … then mutates to the point where it’s infectious in humans. So you know bird flu etc., camels they’re not sure exactly how at this point as far as I know how it come in contact, either with their milk or with their meat or with their processing camels that they said be careful with that or is it respiratory. I don’t know as far as for person to person it is respiratory air droplets. And yeah it’s the flu, it’s one of those things, I think you know there are seems like you know every few years or even every few months there’s something around that really becomes worsening and contagious and everything. I think that healthcare people ought to just take their usual precautions and that’s all you can do and you’ll be with the respiratory type precautions with the good mask and the good hygiene and everything. If you do that on a regular basis “universal precautions” like that that’s goanna be your safety bet not to get it. N: Well when you were talking about healthcare providers, you say would localized to the Middle East of course. We hear of this hand full of reports now in the United States starting with the one case in Indiana. But what about like in the case with SARS – it was here, everyone was we’re afraid to get on planes, trains, were you didn’t want to be around people wearing masks every time you saw in a news coming out of Asia, everyone had these masks on and they just disappear. It seems like we have this huge preparatory state of emergency for this, and then it was just gone. Do you anticipate that this will be the same type of thing? H: It’s really hard to tell. Nobody’s for sure how that why SARS went away if ‘’’s just you know mutated itself out of existence, if all the precautions made it worst people didn’t get it or if just still around somewhere and just not being affected. Same thing about the MERS. I mean there certainly a possibility that it will just play itself out but we obviously need to be careful with this new things, we don’t know what’s goanna happen it’s Coronavirus, colds, a lot of colds, upper respiratory infections of Coronavirus. You know if it became infectious as a cold, that would be pretty serious. And then have those severe symptoms which the virus decreases your immunity apparently and somehow affects your pulmonary system and makes you very susceptible to severe pneumonia and respiratory distress. N: Now like SARS when it just disappeared, obviously there were people who were working to develop some type of treatment or maybe even a cure for it and then it was just gone. When something like that happens in a situation like SARS or this current situation, if this virus were to just disappear, is that going to greatly affect research into a cure in case it surfaces again maybe on epidemic or pandemic level or do you just well once it’s gone away and you don’t get any more cases? Do you just gonna put that on the back burner and move on to the next emergency? H: You know I don’t know that for sure. I would think the pretty well back burner there may be some people continue to work on it for a vaccine or something for it just in case. But viruses are so, they mutate so much that who’s to predict that this one won’t mutation and this something at the Coronavirus have a something different nature that the vaccine may or may not help. So it’s really hard to say, it’s hard to keep up with those things. I’m sure for the people who are involved in this and so they just have to try their best to do what they can in the time and facilities they have. So I don’t know, I would guess that if it were go away like SARS there would be a very minimal amount of people working on it and have funds to do it. N: Great. You’ve been listening to Health Professional Radio. I’m your host Neal Howard. We’ve been in studio today talking with the Dr. James Hubbard, one of the nation’s Top Survival Medicine Experts. But we’ve been here talking about a new virus that surfaced late last month in the United States – a virus know as M.E.R.S, MERS or Middle Eastern Respiratory Syndrome. Dr. Hubbard has been here talking with us about how the virus is suspected to have started traveling from bats to camels to humans and now it seems to be a little bit easier to transmit from human to human, although the CDC in the United States hasn’t declared it a full epidemic or even it doesn’t seem to be a full blown scare at this point. But there are precautions that you need to take in any situation especially if you think that you may have this new virus. It’s been great having you here with us today Dr. Hubbard. H: Thank you. Thank you for having me.